The bunny hop is essential for clearing obstacles on a fast track or as a raw climbing technique. It is very efficient in urban settings where most obstacles are flat and square, with clean run up stretches to control the pace of things. 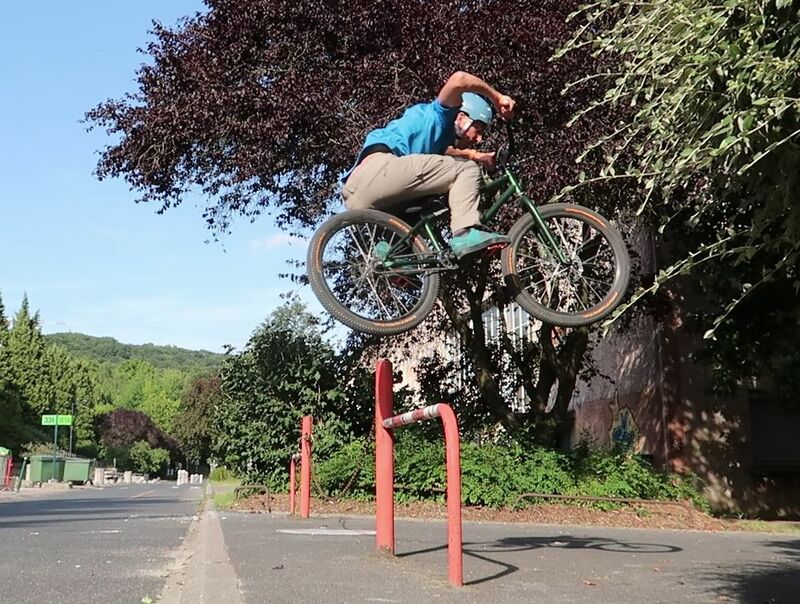 Upright and compact 24-inch street trials bikes or BMXs are kings when it comes to launching bunny hops, whereas 26-inch competition trials bikes can be quite challenging with their high bottom bracket and low steering setup. The plain bunny hop, to clear up small obstacles. Find a comfortable cruising speed, fast enough to clear the obstacle's length during your bunny hop, then stop pedalling and lean forward. As you approach the obstacle, crouch on the bike to compress up both tyres, and at full compression, immediately push back to lean your shoulders back and pull up the front wheel. At full compression on the rear wheel, keep pushing on the ground while moving up over the pedals in a full jump extension. Keep your arms straight until take-off, pulling the bars to your abdomen to maximize the cantilever effect of the bike (and the vertical thrust of your jump impulse as you lift the front wheel up). Upon take-off, fold back from your extension and pull up the bars in front of you to lift the bike up while tucking your knees up to clear the way for the bike. Pointing your feet down, apply back-force on the pedals and push down on the handlebars bars to level up the bike horizontally, lifting the rear wheel further up. Maintain the tucked position until you have cleared the obstacle. 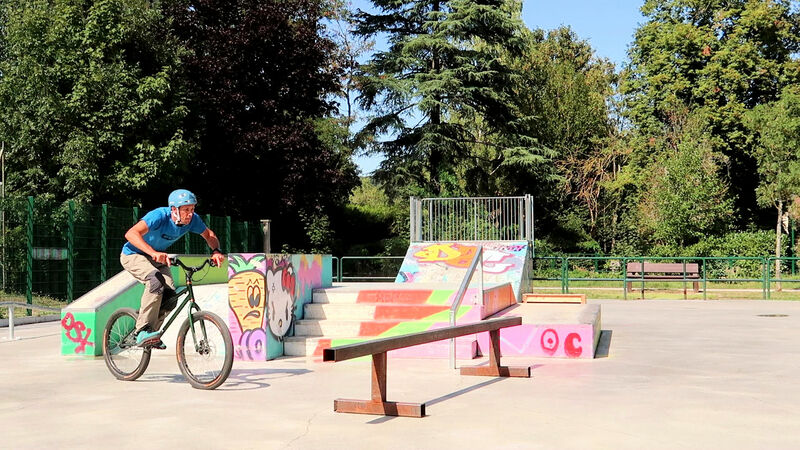 Once the obstacle has been cleared, extend your legs and let the rear wheel drop first for a smooth and progressive landing or land flat on both wheels if you must land into a slope. 1° Build up enough momentum to clear the obstacle length during the duration of your bunny hop, then stop pedalling and lean forward. 2° As you approach, in one fluid motion, crouch on the bike to compress up both tyres, then lean back to push on the rear tyre. 3° At this stage, straighten both your arms and legs to shift your full weight over the rear tyre and lift the front wheel, keep pushing on the ground. 4° Keep your arms straight to maintain pressure on the ground while moving up on the high pedal position to complete a full jump extension. 5° Upon to take off, fold back from your extension, pulling up on the bars while lifting up the knees to clear the way for the bike. Level up the bike. 6° Tuck until you have cleared the obstacle, then extend your legs and arms for a smooth touch-down. Damp the impact. Tuck your knees and pull on the handlebars to lift the bike up. The whole bunny hop move takes less than a second. The more energetically you crouch and pull on the handlebars (to bring them to your abdomen during your extension), the more vertical thrust you get before you level the bike up, hence the higher you will take the rear wheel off the ground. Of course, body language and synchronization are key. To make it simple, think of it as a scooping motion performed with the hips. Maximize your impulse as if you were jumping on your feet without a bike (you'd flex the knees, surge into a full extension, and tuck in mid-air to get over the obstacle). On the bike, just do the same, crouch to flex before performing a firm extension on the pedals as they move up (the bike stands up as you push on your legs and pull the bars to your abdomen, which also boosts your own jump). Work on being tonic on the compression and extension phases. Be as explosive as possible during your compression/extension. During your extension, keep your arms stretched (eventually they'll end up along your torso) so you keep pushing firmly on the ground (through the rear wheel) for as long as possible. 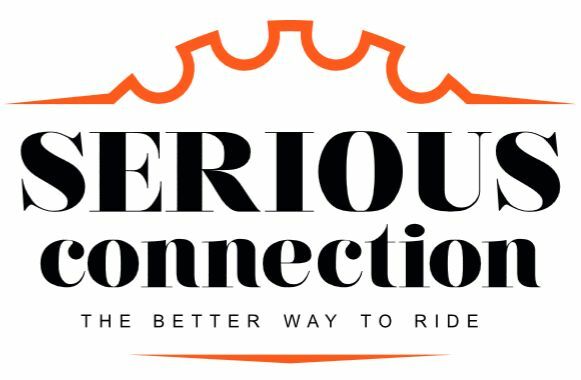 When you have reached the full extension, tuck your knees while pulling on the handlebars to lift the whole bike up in front of you. Then push on the handlebars in front of you, this will help you level the bike horizontal. Although it looks like your feet are stuck to the pedals, in fact they are merely limiting the ascension of the bike. 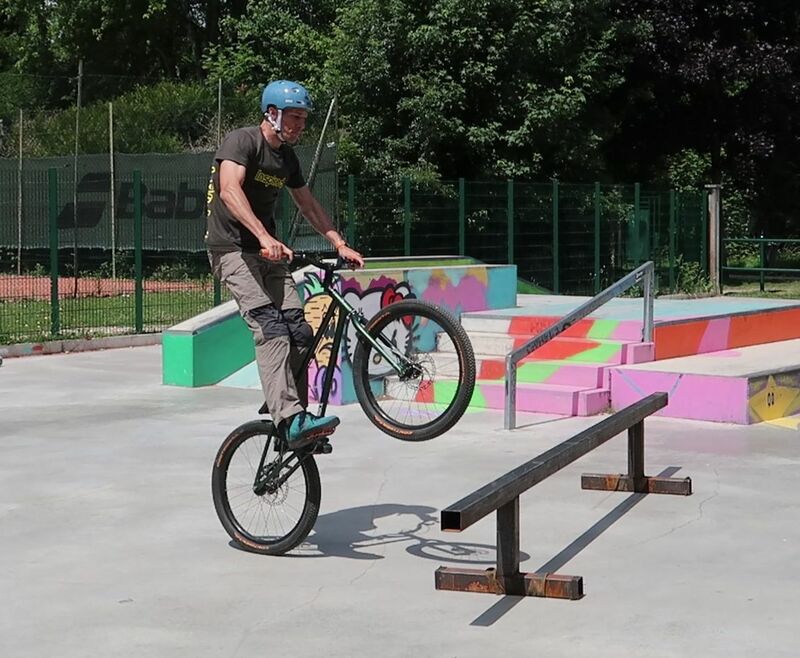 You can increase the rear wheel lift by applying back-force on the pedals, that is, pointing your feet down and pushing back up on the platform to maximise your grip and level the bike up. 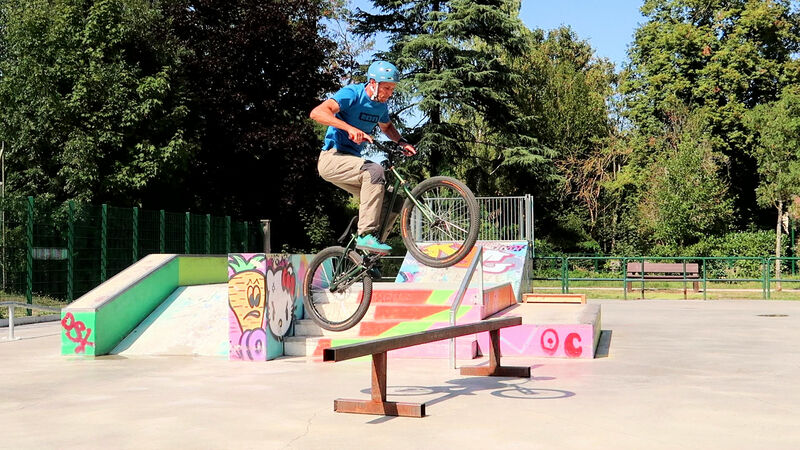 For safety, practise over a bunny hop bar. 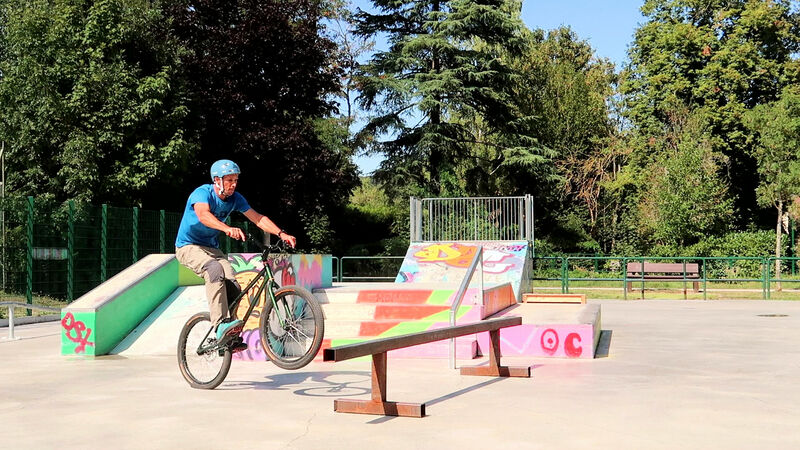 In a perfectly straight bunny hop, you may find that as you level the bike up, the rear tyre hits you in the bum and limits the overall bike lift (and bunny hop height). 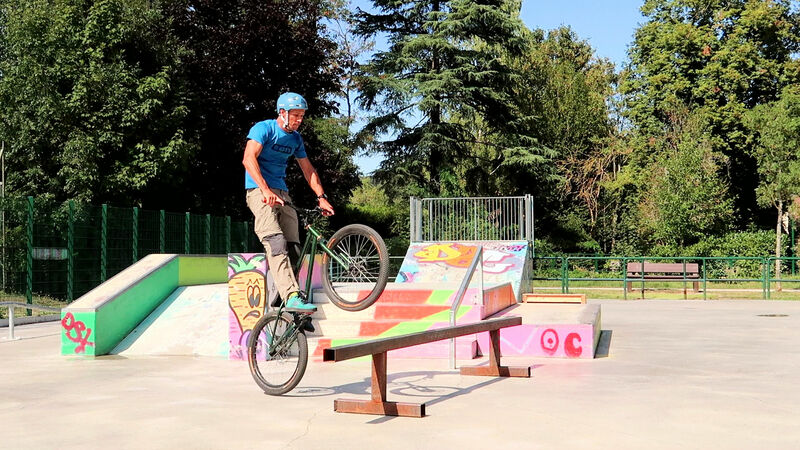 Tuck with the rear wheel on your front-foot side (to pull the bike further up). By tucking the bike slightly sideways to your front foot side, you can clear your bum out of the way to your back-foot side, letting the rear wheel move further up. That little swing sideways will not only gain you a few extra inches, it will also help you clear the obstacle sooner. It is a common misconception to think that clip-pedals would be helpful to learn the bunny hop. But the last thing you want is to have your feet stuck when you need to jump off the bike for a safe bail. 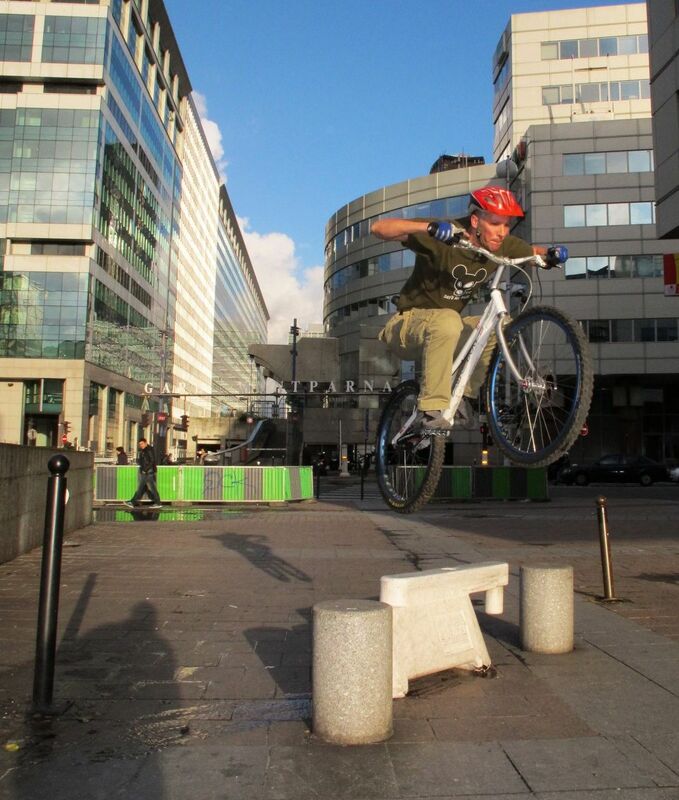 In case of emergency, you would rather land on your feet than on your back, so forget about clip-pedals in trials riding. Instead, learn how to use pedal back-force to increase your lift and control the tilt of the bike. 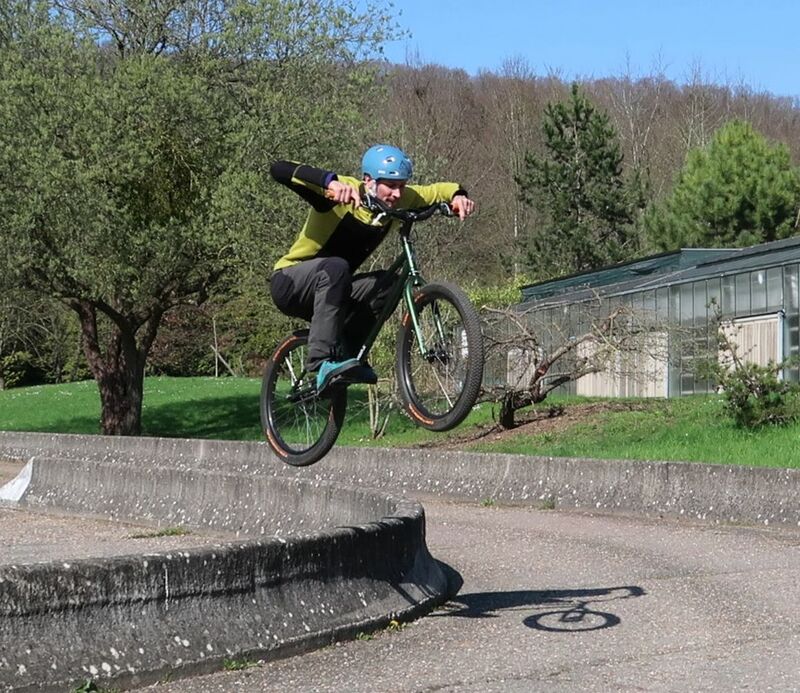 You may want to practise this particular aspect of the bunny hop by first trying to only hop the rear wheel off the ground as you cruise at a comfortable speed, simply lurching forward while pointing your feet down to scoop your pedals up. 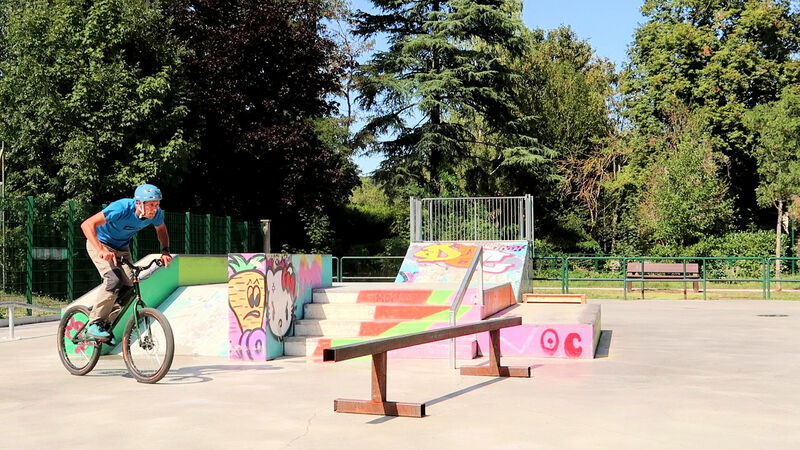 On a flat ground and without a kicker ramp or bump boost effect, bunny hop height and speed are unrelated variables. But both must be carefully planned depending on the obstacle you want to jump over. 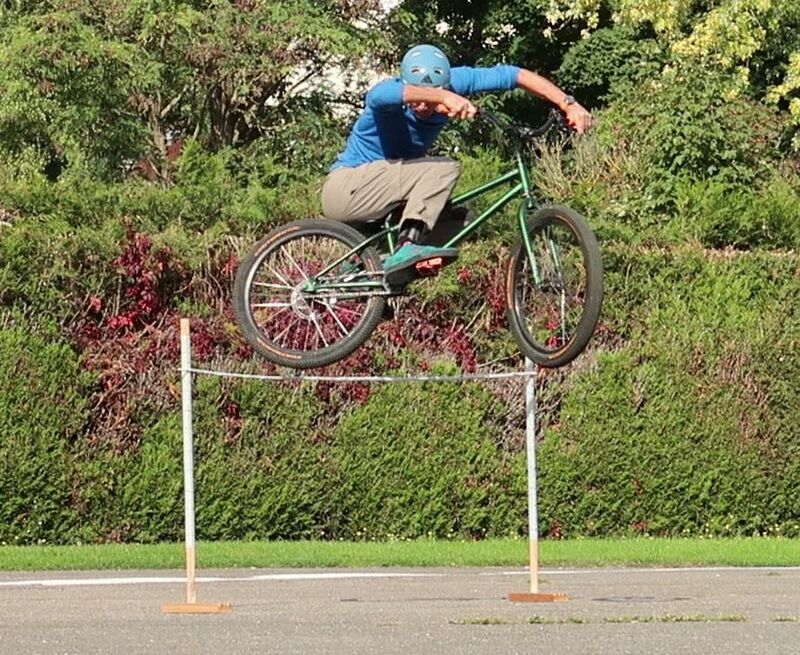 Whether you want to bunny hop over a high railing or flat over a large gap, you must evaluate the necessary speed and identify the corresponding take-off point to maximize your bike lift right over the highest part (or mid-length) of the obstacle. In effect, your approaching speed will define the distance between where the initial bunny hop action takes place, such as the compression and push-up in extension, and the point where you'll be at your maximum tucking height. Only experience will let you judge how slow you can afford to go to get over a railing (or how fast you should go to cover a long gap).